We need to be full of faith and urgent purpose to tirelessly pursue whatever it is that Papa gives us to do. But we also need to understand that without him we can do nothing and it's not about our actions but about his nature. The river verses in Ezekiel and Revelation help us understand this. We need to be like Esther (Esther 10:4-9), people who will not shrink back in the face of danger but will be bold. Just as Esther fearlessly facilitated life for her people, so we need to be fervently taking hold of the life that is offered to us and eagerly passing it on! We desperately need the inner thirst that Chris Duffett expressed. Bursting with faith and urgency - We need to recognise the 'fresh-faced faith' we see in others and find it in ourselves, we need that 'burning desire for Kingdom' and the 'urgency in people meeting with [Papa]'. Like Chris, we need these things to be 'right at the heart of what [we] do', we need to 'know it's not down to [us]' (it's Jesus who will do it) and of course we need '[to] be willing'. There are many we can reach who are dying for lack of the river of life within them. Doesn't this bring out the great significance of Jesus' words in Matthew 25:31-46? We have living water, are we going to withhold it? But in all of this we should also remember that we are his people and that he will guide us moment by moment in our lives. It won't necessarily help to plan our own complex route into unknown territory. Better by far to trust the Guide who has already been there and knows the way - the One who indeed is the Way (John 14:5-7). 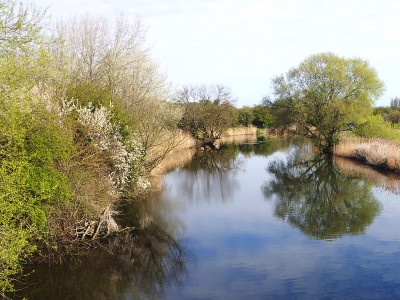 The river grows as it flows - Notice how the river grows (Ezekiel 47:3-5). This is not normal in desert country because rivers grow as tributaries join them and tributaries are rare in the desert. If Esther was the river in Mordecai's dream might we all be like rivers? Jesus said we'd do even greater things than him (John 14:11-13). He reached Galilee, Judaea, a limited number in Samaria and a handful of Romans and Greeks. Paul reached much of the northern Mediterranean, in the following 300 years almost all Europe, North Africa, and parts of south-west Asia were reached. And today this river we call the body of Christ has penetrated almost the entire world. So the river that sprang from Christ flows into the desert country where there is no water, and brings life. The living water is the Holy Spirit (John 7:37-39). And those who are his tributaries are springs of life arising because he is in each one of us. But surely the river in the vision has no tributaries? Ah, but it does. As tributaries we are hidden because we are in Christ. Our little springs of living water are already mingled with his, we don't need to flow into him, we are already in him, we are hidden tributaries and have no independent existence. Apart from him we can do nothing (John 15:4-6). Seeing it like that might tempt us to think that the river grows because we somehow add our independent little springs of water to his. But it is not like that at all. The spring welling up in me is the living water he provides because Christ himself is the Source living in me and living in you. The mystery - The source of the river is the temple, specifically the altar in Ezekiel 47:1 or the throne in the city in Revelation 22:1. The altar speaks of the old covenant, of sacrifice and of priesthood. The throne speaks of the new covenant, of rule and of royalty. Jesus is the Lamb, a living sacrifice and he is the King of kings, who rules over all. And we are his royal priesthood (1 Peter 2:9), set apart for his use. It's a mystery! Jesus is all in all for us who believe, he is absolutely everything we need. What a relief to know that nothing depends on us any more. That doesn't mean that we have no work to do. It means that whatever he calls you to do you will be able to accomplish because he is in you and you are therefore filled with his Spirit! Part of your calling is already clearly expressed from Jesus' own mouth. Love the Father with everything you have and are (Matthew 22:37). Love one another as Jesus loved those around him (John 13:34-35). Go and make disciples everywhere (Matthew 28:18-20). And so on. But part of your calling will be shown to you as you go along. The Holy Spirit will reveal it step by step on a need to know basis. How do you demonstrate your love for the Father? Think about your brothers and sisters in Christ, how do they know that you love them? Are you actively making disciples? How can you improve your listening to the Spirit? Ezekiel and Revelation both describe a river springing from the Jerusalem Temple. 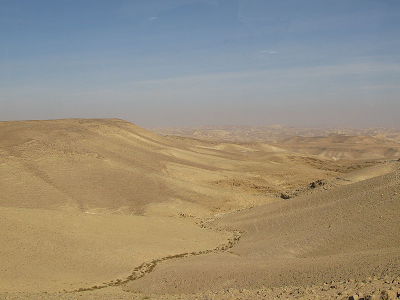 The river flows out into desert country and brings life to the desert and to the salty Dead Sea. The conversation between Jesus and the woman at the well helps us understand the meaning of the river. Let's see what we can learn from Ezekiel 47:1-12. Nothing you read below is based on detailed study of the Hebrew or theological analysis, it's simply what the Holy Spirit highlighted as I read the passage and meditated on it. I sat with my friend Sean last Monday (we meet most Monday evenings) and we had fresh insights that I would, on my own, have missed. So thanks Sean! There are great similarities between this Old Testament passage and Revelation 11:1-2 and especially Revelation 22:1-5. We were also drawn to John 4:1-42 in which Jesus speaks with the Samaritan woman at the well. In fact let's look at that first. The woman at the well - After striking up a conversation about water, Yahshua tell the woman that if she'd known who he is she'd have asked him and he'd have given her 'living water' (John 4:10). She knows the well is the only local source of water so she's puzzled. In Jewish thinking (and probably in Samaritan thinking too) living water means flowing water. Water in a well is not flowing so it is not living. Jesus says this living water from him is special, if you drink it you won't get thirsty again. In fact it will become a spring welling up inside and will result in eternal life (John 4:13-14). The water of life is a free gift to any who will come and take it (Revelation 22:17). The temple and the flow of water - The temple in Ezekiel 47:1 seems to me to represent the church. In the New Testament the church is the community of people who believe in and follow Yahshua (Jesus). there are several metaphors for the church - the body of Christ (Ephesians 4:12), the Bride of the Lamb (Revelation 21:9), and often a temple (2 Corinthians 6:16) built of living stones (1 Peter 2:5). If the temple represents the church (in Ezekiel and in the similar passages of Revelation), then this river of life that trickles and grows from under the threshold of the temple comes from the foundation that lies under the church, and that is Christ (1 Corinthians 3:11). So this trickle of life, this living water is in all of us who believe. If you are in Christ and he is in you, his unending supply of life will flow out through you into a thirsty world. You will never need to visit a well to pull up a heavy bucket of water. That is getting water by your own effort, it's hard work and you can never draw enough to satisfy yourself, let alone others. But the living water from within flows without ceasing and is fresh and clean and fully satisfying. The east - Why does the entrance of the temple face east? Is this significant? Yes, I think it is. East is the direction of rising, all the stars and planets rise in the east and set in the west, the moon and the sun also rise in the east. Jesus is described as the morning star (2 Peter 1:19), and he is the rising star (Revelation 22:16). The ideas of east, rising and morning are closely related, so the river leaves the east gate. It first appears inside the southern part of the temple near the altar, runs through the temple court (see Revelation 22:1-2), and then flows under the southern side of the threshold of the east gate and from there heads east from the city. More on the river - The river grows rapidly larger as it flows, and after just two kilometres (about a mile and a quarter) it's already too large to wade across. From there, the river flows to the northern part of the Dead Sea and it turns the clear but sterile, salty waters into fresh water and the Dead Sea teems with a wide variety of fish. Along the river's banks grow the trees of life that fruit every month and produce leaves for the healing of the nations. This is truly the river of life! It brings fish to a dead sea, provides trees in the desert, and heals the world's people. The river is also mentioned in Esther 10:4-9. And let me tell you you won't find those verses in your Bible (unless you pick your Bible very carefully), but that's another story. Esther is here identified as the river. And why not? Just think, the river flows in those who love and honour the Lord. The river is life for his people. Jesus said that streams of living water would flow out of us (John 7:38). It's not hard to see that the river flowing out of Esther brought life to the Jews in captivity. Note: Mordecai's dream is given in Esther 11:2-12 which is in the first chapter of the Greek version of Esther. (Are you confused yet?) I should also point out that the Greek sections of Esther seem to have been added later to the original Hebrew. Most Bibles provide only the Hebrew parts. In the next post we'll look at the river of life again and dig into what it all means for us in practice. How do you feel about your own flow of spiritual water? Have you received the living water that Jesus provides? Most of us feel like barren deserts sometimes. If you have felt that way, how were you refreshed and renewed again? Do you know someone in a spiritual desert right now? Who do they need to have a conversation with? 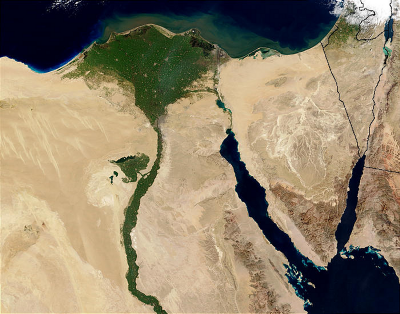 The Nile runs through the Sahara. Can you list some ways life is different in Egypt because of the Nile? THOUGHT - Tent pegs in bronze? In some correspondence recently I wrote, 'Let the Kingdom be extended. Spread the tent pegs wider still'. What did I mean by that? 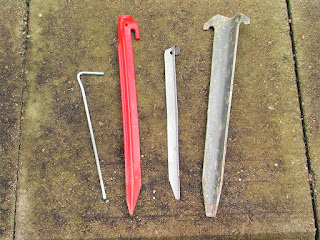 For some, the tent peg reference may be clear, for some it may seem odd. When I wrote, 'Let the Kingdom be extended', it was me speaking in my own words. I am hoping, praying, and expecting to see Christ's Kingdom extending further and wider and deeper in my own life and in the lives and activities of others near and far. But what about those tent pegs? The church is also a kind of tent, a tabernacle. Just as the Tabernacle was a mobile, temporary precursor of the Temple that would later be built in Jerusalem, so the church is a mobile, temporary precursor of the Bride that is yet to be fully revealed. Just like the Temple to come, the Tabernacle contained an innermost place where Yahweh rested in utter glory. And where is his glory contained in the church? In the heart of every member, every part of the body, poured out in abundance at Pentecost and still burning brightly in every follower of Jesus today. The power and the glory of the Most High, the Father and the Son and the Spirit, is contained in us. We are the bride of the Lamb. That power and that glory is intended to be manifest in us today. It always was, it always will be. Israel wandered in the desert for forty long years, sometimes grumbling, suffering needlessly because they had refused to go straight in to the promised land. Has the church done this too? Are we afraid of 'the giants in the land'? What are our giants? What prevented us going straight in? 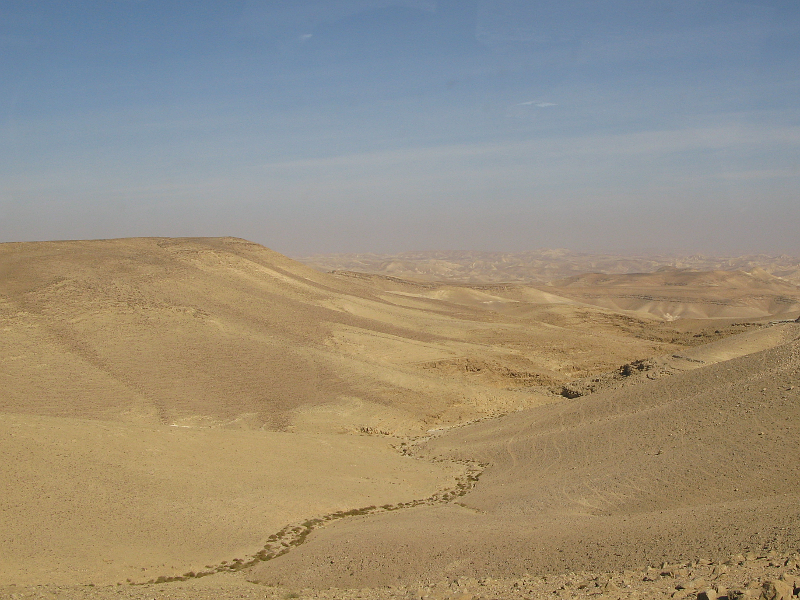 What did Israel learn in the desert? What has the church learned in 2000 years of 'desert wandering'? But back to those tent pegs. I was quoting from Isaiah 54. (The word 'stakes' in verse 2 (NIV) is translated pegs in, for example, the NASB.) We noticed this chapter in the late 1970s and spent some time thinking about it prayerfully. I believe this passage is about the church, the bride of the Lamb. Forty years on, is it time for a fresh start into the place of promise? What does it mean to enlarge, stretch, not hold back, lengthen, strengthen? But this comes with a warning. None of it will happen if we are looking for power or glory. Instead we need to have a burning hunger for Jesus - and only for him. And everything we think and do must be not only in his name, but for his sake and for his glory. I'd like to hear what others think about this. Please comment.